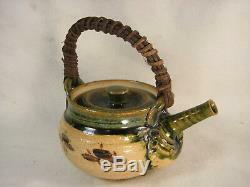 This is a vintage special Japanese tea set (tea pot and 5 tea cups). 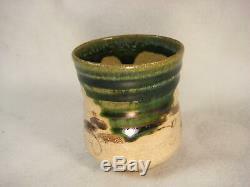 This is Oribe ware (see picture of the box), one of the famous. 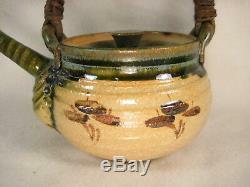 Each tea pot and cup has hand painted floral design and green glaze. 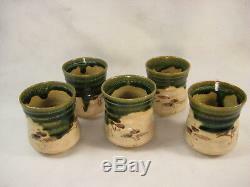 They are all made of a high fire ceramic and signed by the artist Ohkiguro (see picture 9). Having never been out of their wooden presentation box in over 30 years, they remain in very fine condition. 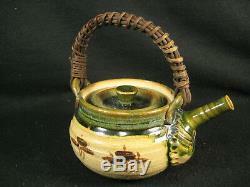 The tea pot measures about 4 1/2" diameter (11.5 cm) by 3 1/2" tall (9 cm) not including the handle or spout. 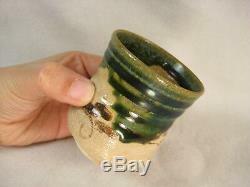 Each tea cup measures 2 1/2" in diameter and 3" tall (6.5 x 7.5 cm). 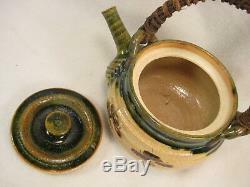 It holds about a half liter of liquid. You'll love it, I guarantee it......... Satisfaction Guarantee: All items are carefully described and photographed. 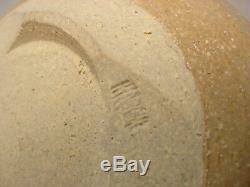 Most items listed are antiques, and as such may have an expected amount of wear from normal use. 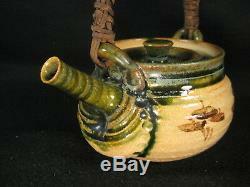 We do not sell items with major flaws without mentioning it in the listing. See photos and descriptions for condition. 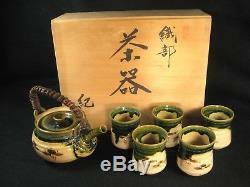 The item "ANTIQUE JAPANESE SIGNED CERAMIC TEA POT & 5 TEA CUP SET ORIBE WARE WITH BOX" is in sale since Thursday, January 24, 2019. 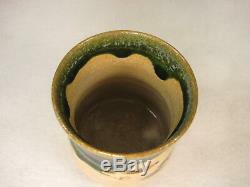 This item is in the category "Antiques\Asian Antiques\Japan\Tea Caddies". 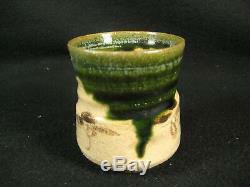 The seller is "sailerking" and is located in Portland, Oregon. This item can be shipped worldwide.